The countries of East and South East Asia and the Indian sub-continent are at different stages of industrialization. The respective governments have used various methods to exchange access to their lucrative markets for technology or economic investment, as a way to maximize their potential and accelerate industrialization. To be competitive, firms face the prospect of satisfying these requirements and manufacturing within specific geopolitical boundaries. Motorcycles are sufficiently complex to require the coordination of a significant number of suppliers by vehicle manufacturers. With a business model similar to that of automobiles, it maybe viewed as a stepping stone towards this more complex industry. After the unleashing of the Chinese economy started in 1979 and despite the economic crisis of 1997 and 2008, the region has become the world's motorcycle manufacturing base. The factors that effected the development of each market vary and so does the nature of the products. Although GDP per person is generally much lower than more developed economies, it's rising and this has consistently created a period of time in which motorcycles have been the mobility solution of choice for vast numbers of people. Population in the region far exceeds that of the developed world and as living standards improve, it has become the destination for ever more sophisticated products. The area is far from homogeneous and scratching the surface reveals significant cultural diversity. Just taking religion as a measure we find huge variety; Pakistan; Muslim 97%, India; Hindu 80%, Sri Lanka; Buddhist 70%, Vietnam; Buddhist: 52%, Non-Religious 30%, Thailand; Theravada Buddhist 93%, Malaysia; Muslim 49%, Singapore; Buddhist 40%, Indonesia; Muslim 88%, Philippines; Catholic 85%, Taiwan; Chinese Traditional Religion 90%, China; Nonreligious/atheist 60%, Chinese traditional religion 28%, South Korea; Christian 49%, Japan; up to 95% Shinto. Irrespective of religious differences, the West often overlooks the historical ties across the region perhaps presuming that trade within the region depends entirely on the developed world. Furthermore, the influence of the Chinese diaspora passes unnoticed. In 1967 Indonesia, Malaysia, Philippines, Singapore and Thailand formed the Association of Southeast Asian Nations (ASEAN). They were later joined by Laos, Vietnam, Brunei, Myanmar, Cambodia. The member countries agreed in 2007 to lower import duties between member states to zero for most items. The original members of ASEAN concluded a free trade agreement with China called the ASEAN–China Free Trade Area (ACFTA) which has seen a reduction in import tariffs to zero on 90% of imported goods. The remaining 4 countries will follow suit in 2015. Other agreements have been made between ASEAN and Korea, Japan, Australia, New Zealand and India. These measures have helped create the conditions for a boom in intra-Asia trade. Similar agreements are expected with the European Union and Taiwan, the former for decades having remained outside a very high tariff curtain protecting the region. As part of these agreements, reductions to tariff barriers will have a fundamental and far reaching impact on the motorcycle industry in Asia. With regional trade on the increase, whether globalization should have been handled differently or not would seem to be a redundant debate as the opportunities for influencing the outcome are rapidly diminishing. On the one hand it's responsible for lifting countless millions out of poverty, but on the other it will cause the West to confront a socio-economic balance that is unsustainable. A combination of low incomes, over-crowded cities or inadequate public transport increase the practicality of motorcycles over cars in many parts of the region. A similar set of circumstances existed when the Japanese motorcycle industry was in its infancy, leading to the development of practical and inexpensive vehicles, with excellent export potential. 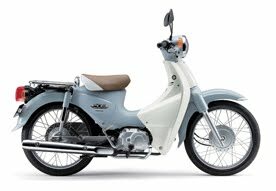 In 1958 Honda launched what would become the most popular motorcycle in history, the Super Cub. Low price, low running costs, reliability and versatility make it the ultimate low-end motorcycle. Honda expanded early across the region, entering Thailand in 1964, Malaysia in 1969 and Indonesia in 1971 where the Super Cub become a ubiquitous feature of the landscape. By 2008 total sales reached 60 million units, but such is its current popularity in South East Asia in particular, 25 million of those sales occurred since 2002. The timing of the decision to set-up manufacturing in a market is complex and expensive. The obstacles range from the suitability of existing products vs market preferences, political cooperation, import tariffs, availability of suppliers, availability of staff, distribution, complexity of regulatory frameworks and the business environment, to simply finding the right business partners. The governments of each country apply varying restrictions in order to promote the industrialization of their home economies. How these manifest themselves depends on the stage of industrial development in each country. China, India and Taiwan have taken different measures to utilize existing industrial capabilities in the motorcycle industry and as a consequence each has unique development characteristics. Other countries, such as Thailand, Indonesia and Vietnam view the motorcycle industry as part of their own core industrialization process but in doing so have become subordinate to Japanese dominance. Honda's philosophy has consistently been to manufacture product as near as is economically and politically expedient to the target market as is possible, which they call the "market-in" approach. Operating in the market provides ample opportunity for makers to understand customer needs and to influence the market's overall direction. The historic and ongoing capital investments and alliances built across Asia by the big 4 Japanese manufacturers, gives them a 20 year head start over their European and American rivals. As the bastion of low-end motorcycles where cost leadership is critical (and therefore usually low margins), Asia dominates sales statistics and of the 47 million units sold in the world in 2008, 83% were in Asia and Japan. In 1997 Honda established that a GDP per capita threshold of $1,000 signaled the prelude to a surge in motorcycle sales and at that time, many countries were poised to enter that phase. The chart illustrates the state of penetration of 2-wheelers in the principal Asian markets (apart from India). The market is driven by replacements rather than expansion when the "new sales" to "in-use" ratio reaches 15-20 and the "people per vehicle" is less than 3. As economic conditions change across the region, so will the attitude to motorcycles, but will the burgeoning middle-class immediately transition to 4 wheels leaving the motorcycle in a purely utility role or will new motorcycle life styles emerge to receive high end motorcycles? When will governments invest in infrastructure to facilitate the use of more powerful bikes? How will governments legislate when they approach motorcycle saturation point as in Taiwan? Indeed, as each country is different, what will be the role of the motorcycle in the future? Will new products emerge that are more suited to life in the region? Will Chinese or other regional manufacturers rise up to challenge the Japanese hegemony or will European and American manufacturers enter a rapid catch-up phase? As time passes, all will be revealed.